Social Media By The Minute: A workbook for the over-worked, over-stressed, over-burdened small business-owner who wants to do social media but doesn’t have the time! This Workbook is designed to help you “do social media” but on your timeframe. It is broken down into 5 minute increments – if you have 5 minutes in a day, start there. If you have 10 minutes, you will take it to the next level, 15 minutes, the next level and so on. The goal is 30 minutes per day on social media for maximum impact on your business. The breakdown looks like this: 5 minutes – Ratings and Reviews Sites and, 10 minutes – Facebook and, 15 minutes – Twitter and, 20 minutes – LinkedIn and, 25 minutes – Pinterest and, 30 minutes – Periscope There are 6 workbook pages per day (for a month’s worth of work) with tips and suggestions, as well as a place to note your activities. Use as needed! Pinterest is a ‘must do’ social media for any marketer or businessperson in retail, do-it-yourself / crafts / hobbies, and/or the female shopping demographic. With its unique concept of ‘idea boards, ‘ Pinterest allows users to brainstorm ideas for their next camping trip, the ideal products to buy for their college dorm room or destination wedding, ways to be a better knitter, and even dog toys for their favorite black Labrador retriever, Buddy. By setting up a company Account on Pinterest, creating ‘idea boards’ that help your customers preview and pre-experience related products and services, and by being an active ‘Pinner’ of not only your own products but those of others… you can use Pinterest as the ideal social media to drive traffic to your eCommerce online store. “If you know how.”.. Small businesses and large businesses alike can leverage Pinterest for amazing free marketing opportunities. Even better you can research Pinterest, discover it is NOT for your business, and sleep easy at night free from Pinterest GUILT, that nagging feeling that if you’re not “on” Pinterest, you’re missing out. If you want to learn how to use Pinterest for business, this is your book. This isn’t a fancy book. This isn’t a pie-in-the-sky Pinterest marketing book. This is a practical hands-on book, with links not only to free tools but to step-by-step worksheets. By the end of the book, you’ll have a Pinterest marketing plan ready for your business. Author Jason McDonald has been active on the Internet since 1994 and has taught SEO, AdWords, and Social Media since 2009 – online, at Stanford University Continuing Studies, at both AcademyX and the Bay Area Video Coalition in San Francisco, at workshops, and in corporate trainings across these United States. His passion is to take complex marketing topics such as social media marketing and make them easy-to-understand for small business owners and marketers. His style is practical, hands-on, and fun. He received his Ph.D. in 1992 from the University of California, Berkeley, and his B.A. from Harvard University in 1985. When he’s not surfing the Internet, Jason can be found being trained by his black Lab, Buddy, across the highways and byways of the San Francisco Bay Area. IMPORTANT: – This is the ** OLD ** Edition – CLICK ABOVE on ‘See All 3 Formats and Editions’ above and Select the JULY 2016 ** NEW ** Edition OR – Search for ‘Social Media Marketing Workbook 2016’ to find the ** NEW ** Edition Learn how to market your business on Social Media for free! Social media is big – really big. Facebook has over 1 billion users, and LinkedIn has over 350 million. Today’s customers go online to review sites like Yelp and Google+ to check out businesses before they engage. Whether it’s on Twitter, on Instagram, on YouTube, or even Pinterest, your customers are “on” social media and they are talking about businesses, products, and services just like yours. Small businesses and large businesses alike can leverage social media for amazing free marketing opportunities. If you know how… you can market on social media effectively. But do you know how? Or are you confused, befuddled, lost, or just spinning your wheels while your competitors blast ahead on Facebook or Twitter, LinkedIn or Pinterest, YouTube or Yelp? Enter the Social Media Marketing Workbook, your step-by-step guide on how to market your business on social media. SOCIAL MEDIA MARKETING – an easy explanation of what social media marketing really is, and how to “think” about social media marketing. POSTING STRATEGY – creating great content is the first step, and knowing how to post it is the second. The SOCIAL MEDIA MARKETING WORKBOOK explains how to find other people’s content to share and how to create your own content as well as how to OPTIMIZE and PROMOTE your social media efforts. Using no-nonsense language, realistic examples, easy-to-follow steps and practical exercises, this book guides students through various types of public relations writing. A focus on ethical and legal issues is woven throughout, with examples and exercises that deal with public relations as practiced by corporations, non-profit agencies, and other types of organizations large and small. In addition, the book addresses the most comprehensive list of public relations writing formats to be found anywhere–from old standbys like news releases to electronic mail and other opportunities in new technologies. Laying the foundation for an integrated approach that touches on public relations advertising and direct mail, this second edition is divided into four parts. Part I deals with principles of effective writing useful in all disciplines. Part II focuses on news as the bridge an organization can build to its various publics. Part III takes you through a variety of writing formats and environments that provide an internal or controlled approach. Part IV is the wrap up that pulls together the various writing styles presented in this book as part of an integrated communication package. Becoming a Public Relations Writer is a different kind of textbook for college and university students. It provides writing instruction for people preparing to enter the profession and guides students with models and step-by-step patterns designed to increase competence and build confidence in students on their way to becoming public relations writers. Becoming a Public Relations Writer is a comprehensive guide to the writing process for public relations practice. Using straightforward, no-nonsense language, realistic examples, easy-to-follow steps and practical exercises, this text introduces the various formats and styles of writing you will encounter as a public relations practitioner. A focus on ethical and legal issues is woven throughout, with examples and exercises addressing public relations as practiced by corporations, non-profit agencies, and other types of organizations both large and small. In addition, the book offers the most comprehensive list of public relations writing formats to be found anywhere—from the standard news release to electronic mail and other opportunities using a variety of technologies and media. Do you need content ideas for your email and social media? Do you want your message to stand out and rise above the noise? Your business story should be the best story you’ve ever told. Reach your target audience with proven inbound marketing strategies and content management practices. Get ready to learn how to successfully engage others and build an effective online presence. Whether you know everything or nothing about social media, this workbook will motivate you to get excited about your marketing again! The focus of this text is to assist those who want to benefit from the full potential of social media to promote themselves, their business, or organization. It is packed with ideas for generating leads and creating engaging social media content. Receive strategies for consistently staying positive in your tone and message. You will also get 365 days of content ideas within a 1 Year Editorial Calendar, and you’ll be mastering your own editorial content before you know it. If you are a social media trainer, this is a great manual for you to use in your workshops. If you are a do-it-yourselfer, and you want an affordable option for learning about social media and content marketing, then this workbook is for you. The Conflict Resolution Training Program Participant?s Workbook offers both new and seasoned negotiators, mediators, and arbitrators a step–by–step approach for learning dispute resolution techniques. This hands–on workbook is filled with a variety of exercises, activities, worksheets, role plays, and other interactive techniques that are readily accessible for learning the skills needed to resolve conflicts. Trainers and participants can select the sections of the flexible program that best meet their specific objectives and goals. This book, based in part on Lynn Grodzki’s book Building Your Ideal Private Practice, is a year-long, progressive practice-building program offering therapists an abundance of information, ideas, and strategies for working successfully in private practice. Whereas Building Your Ideal Private Practice was a comprehensive guide to practice building, this workbook is a month-by-month coaching program, giving readers the experience of being coached for a year. This book will help you answer some key questions about your private practice: How can I work as hard as I need make enough money and maintain a quality personal life? What does it take to build a profitable business without expending so much personal effort? How can I be as successful as I want to be, and feel rested and healthy? Is it possible to be a therapist in private practice and have an easier life? How can I use a simple business model to build and expand my private practice? You can begin to use this book in any month, or review and re-use the book year after year as your annual coaching program. In keeping with the Private Practice Success T business model, the first four months of the workbook focus on aspects of preparation, the second four months highlight building blocks, and the final four months craft the finishing touches. Each month offers a progressive series of assessments, written exercises, and skill sets, helping readers to identify action steps to take and follow that month with fieldwork suggestions. A companion to the award winning Dragonfly Effect, the Dragonfly Effect Workbook, reveals how everyday people achieve unprecedented results through harnessing the incredible power of social media. This workbook will help you further explore and understand how to tap into social media using psychological insights to achieve a single, concrete goal. Here you’ll explore thought-provoking exercises to achieve both social good and customer loyalty by leveraging the power of design thinking with practical strategies. 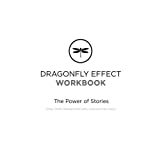 The Dragonfly Effect workbook proves that you don’t need money or power to inspire seismic change.